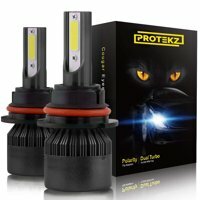 Product - OPT7 Fluxbeam CORE H11 H8 H9 H16 LED Headlight Bulbs with FX-7500 CREE Chip Plug-N-Play Conversion Kit - 6,000LM 6000K Cool White - Built. Not Bought. Product TitleOPT7 Fluxbeam CORE H11 H8 H9 H16 LED Headlight Bulbs with FX-7500 CREE Chip Plug-N-Play Conversion Kit - 6,000LM 6000K Cool White - Built. Not Bought. COOL BLUE BRILLIANCE. 2,988 lumens in our modern icy 6000K hue – up to 3X brighter than your stock halogens. Sold & shipped by DT Trading Inc.